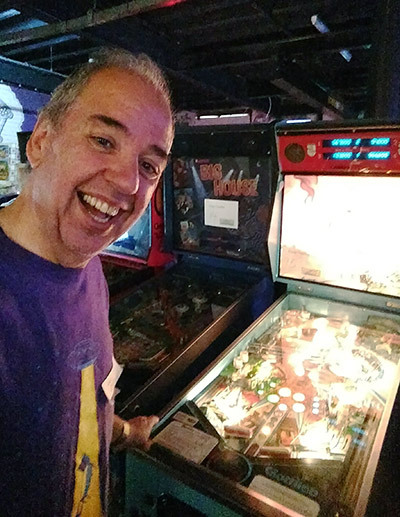 As a change from our usual reporting style, this look at the annual 8BitFlip tournament weekend will be done as a personal blog by the Editor of Pinball News, Martin Ayub. I signed up for 8BitFlip the moment the dates were announced, back in October last year. Knowing the nearest hotel quickly sells out, I made a booking for the Friday and Saturday nights for myself and a friend. We both went last year but had to stay at a more remote hotel, so I wanted to make sure we would be able to walk both to the show's venue and the city centre for post-show entertainment. Sadly, my friend had to cancel just before the 8BitFlip weekend, so I made the Good Friday journey to Bury, near Manchester, alone. 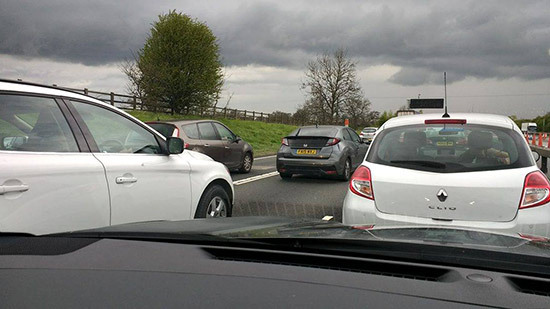 The drive took four-and-a-half-hours, much of which was spent sitting in traffic jams in the many roadworks along the M6 motorway. Fortunately though, there was no great rush to get to the venue as the show itself didn't start until the next day. And after all, what else are public holidays for other than sitting in the car on a motorway going nowhere, discovering that the large white Americano coffee you bought at the service station ten miles back doesn't have any milk in it? But eventually the road signs start to point to Manchester, and then to Bury as we draw near. 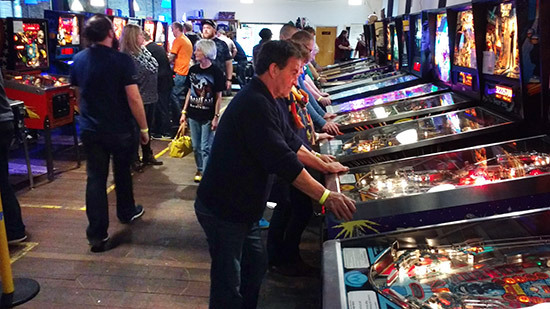 8BitFlip is the competitive event run by the Northern Lights Pinball (NLP) group, who also organise the pinball part of the huge Play Expo show in Manchester in October as well as a number of other pinball events in the north of England. 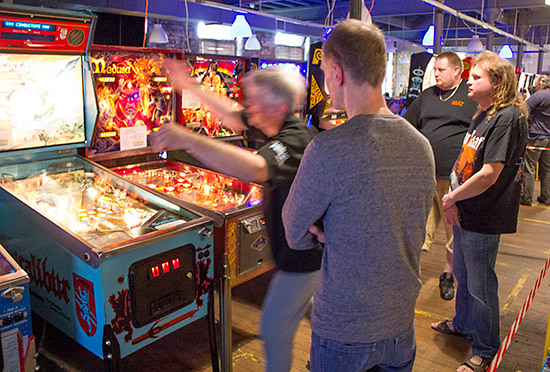 Their main aims are to spread pinball's reach to the general public and to raise money for charity. 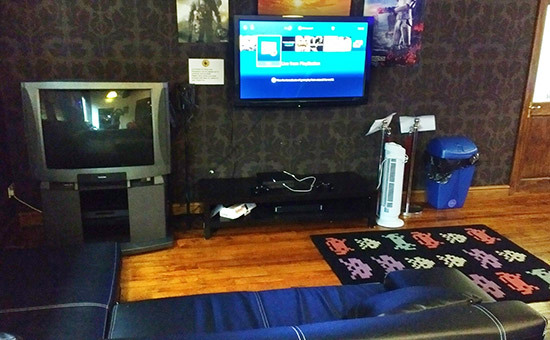 Their usual beneficiary is the Teenage Cancer Trust but this year the 8BitFlip's chosen recipient was closer to home - the sister of one of the NLP organisers, Darren Ball, who needs money for a life-saving operation in America. 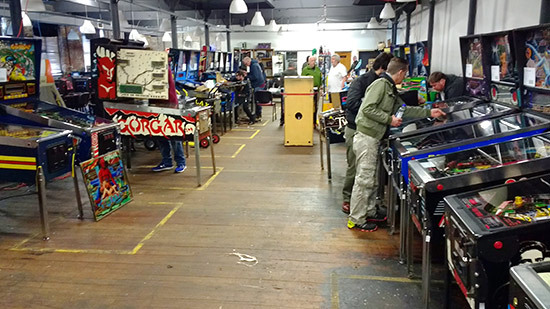 So it was that fifty pinballs were set up on the second floor of a large brick former mill in Bury, the home of Arcade Club. 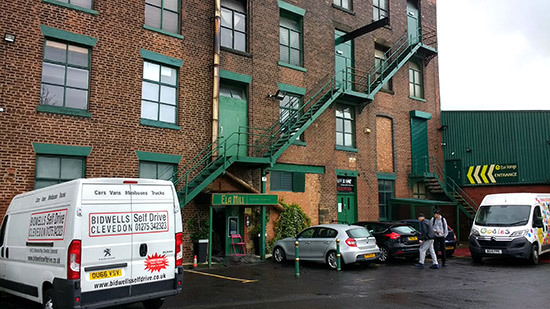 Ela Mill is a strange building. 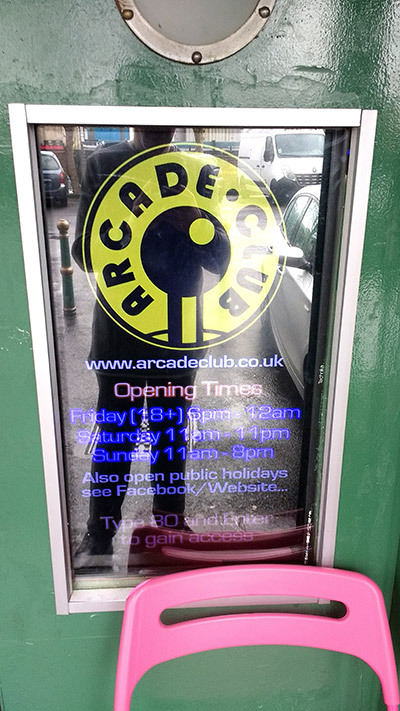 It is now converted and partially refurbished so that numerous business start-ups can operate out of offices on the ground floor, while further up Arcade Club has taken over floors two and three from where it opens to the public on Fridays, Saturdays and Sundays. 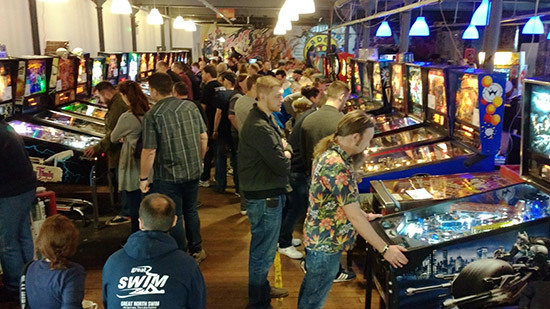 Before we get to the main pinball part, let's have a look at Arcade Club which is a video game heaven for serious gamers in England's northwest. 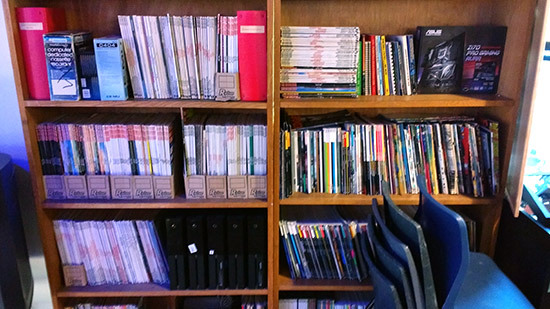 The third floor is where the bulk of the collection resides, and is also where the main reception area lives. 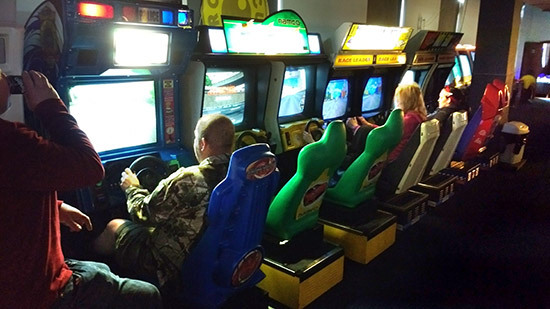 Once inside, a large number of classic and modern video games await, including home consoles, sit-down driving games and assorted shooters. It's kept pretty dark inside, so my phone's camera struggled a little to get any good shots. 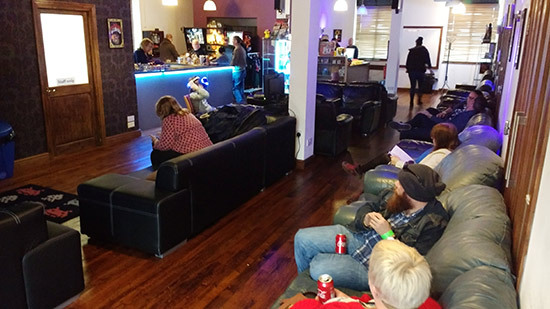 Recently Arcade Club expanded onto the floor below, and it was here that the 8BitFlip event was hosted, combining NLP's pinballs with Arcade Club's games in one show. 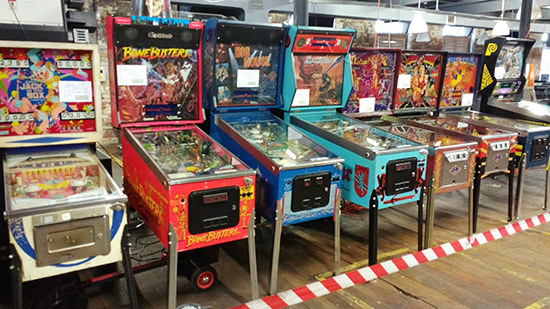 We arrived as the set-up for the pinballs was underway. 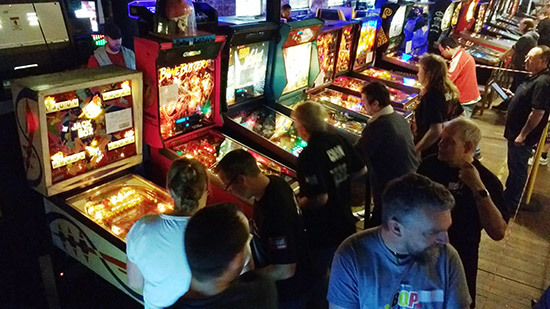 The bulk of the pinballs were arranged in two rows running the length of the room, but there were eleven more owned by Arcade Club in a side room. Entry to play the pinballs and all the video games cost £16 ($20/€19) per day for an adult (£6 for kids under 16) or a weekend ticket was available for £27 (£10 for kids). 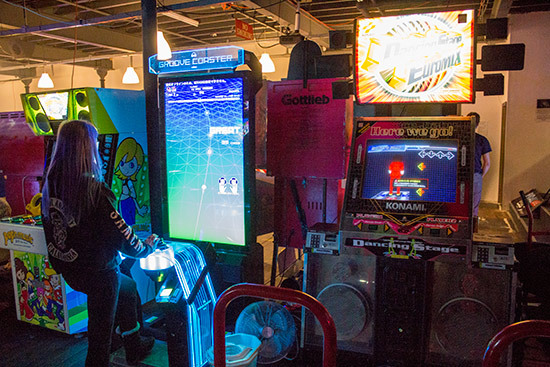 These tickets allowed you to play all the pinballs and videos on the second floor as well as access to Arcade Club's main third floor. 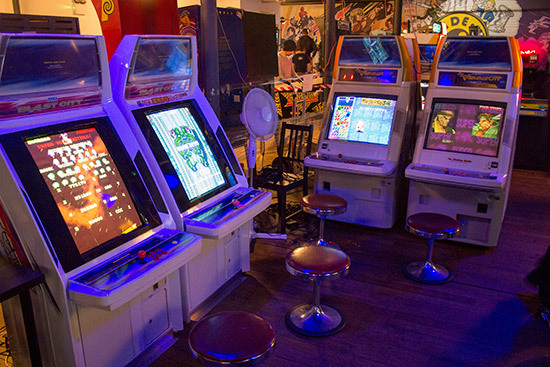 Along with the free play machines there were three additional machines set up on the stage at the back of the room. 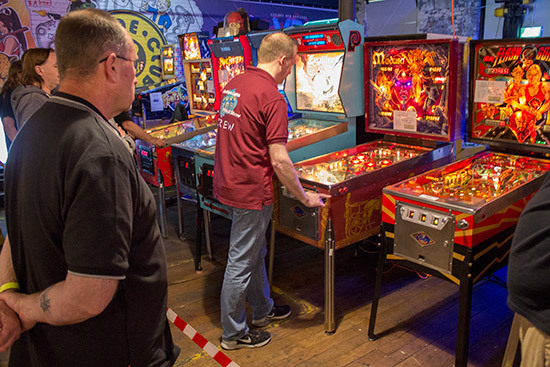 Alien Pinball was here set on £1 per play and fitted with a streaming rig by Pinball Live. On the other side of the stage were two competition machines. The first was a Buckaroo where £1 bought two games with completing various objectives earning a cash prize. 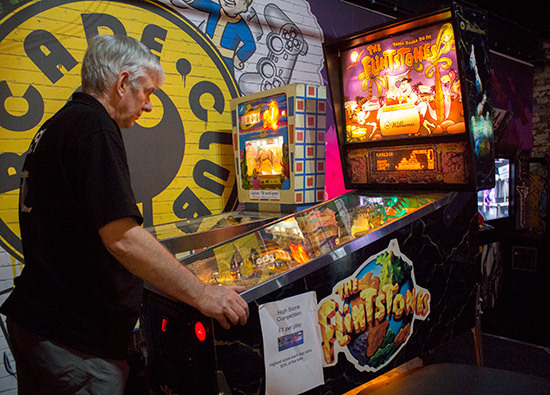 The second game was a The Flintstones which hosted a simple £1 high score competition each day, with the winner taking 50% of the cash box takings. 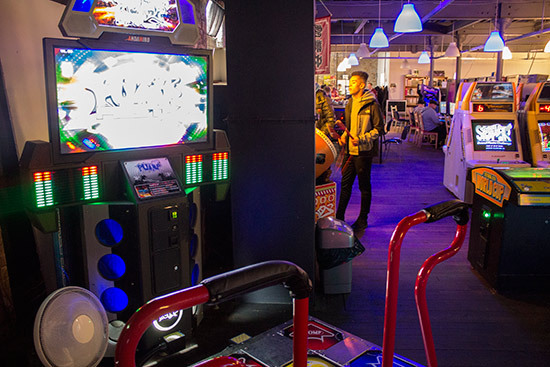 Along with the pinballs, the second floor was also home to some larger dedicated arcade machines such as dancing and music playing games, and a large PC gaming set-up with numerous high-end gaming PCs. 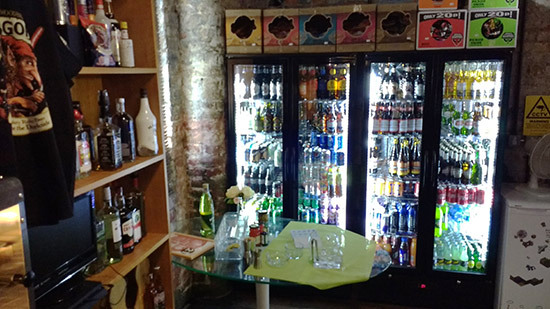 The second floor had its own cafe with a well-stocked fridge providing a nice selection of soft and alcoholic drinks at reasonable prices as well as a constant flow of tea and coffee. 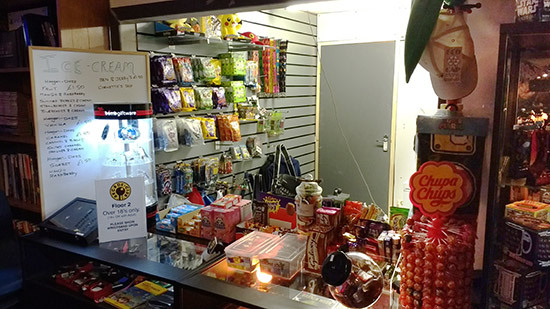 In addition to the cafe, a small kiosk sold confectionary and gaming merchandise. 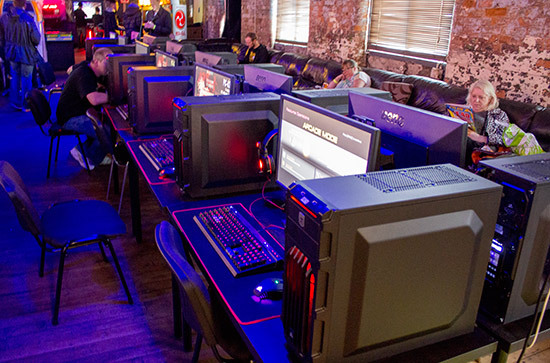 There were two tournaments held over the weekend. 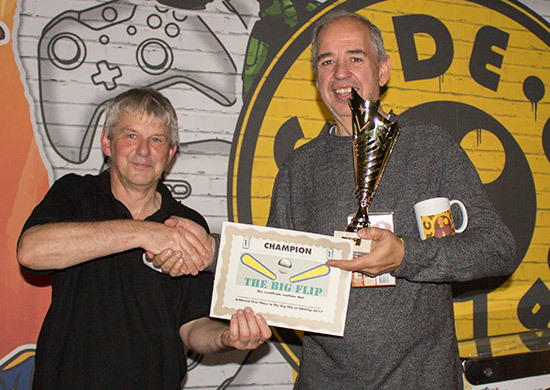 On Saturday, there was the main The Big Flip event which was run by David Dutton (shown above on The Flintstones), while on Sunday we had The Old Flip which was organised by Carl Spiby. The Big Flip began soon after the venue opened at 11am. It cost £10 to enter in addition to paid entry to 8BitFlip. 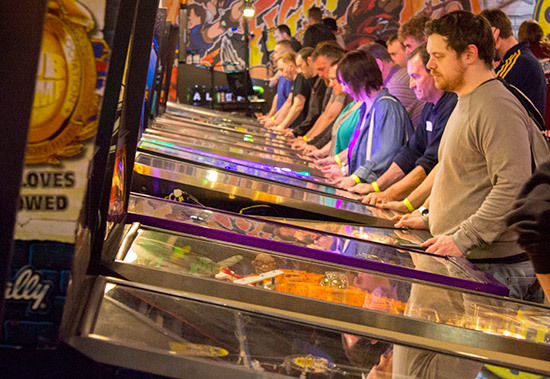 Players signed in and were paired up to play a set of three head-to-head games on randomly-chosen machines out of all those in the hall. If a game was being played by a non-tournament player, you just had to wait until they had finished before playing your tournament game. This was a 'seeding round' where the winner of the best-of-three went to the A division and the loser into the B division. It's not as bad as it might sound as the A and B divisions eventually merge. So losing your first round match is not terminal for any hopes of winning, which was just as well as I was soundly beaten on my allocated games of The Addams Family and Whitewater. Those would normally be great choices for me, but not today. On to the second round, and players in each division were put into groups of four to play a five-game match where the winner of each game earned themselves nine points. Second place got five points, third place two points with no points for coming last. The top two players in each group progressed to round three, but in the A division the group winner got a bye through to round four. 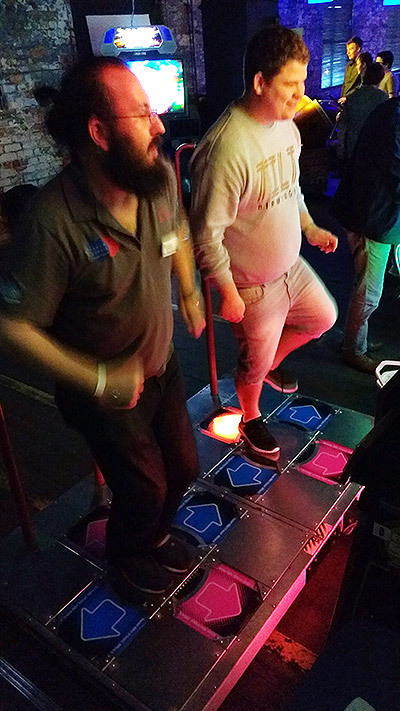 In both divisions, the third and fourth placed players were eliminated from the tournament, but they had the consolation of getting their £10 tournament fee refunded so they could drown their sorrows. My luck improved after such a bad start and I won my B division group to keep going. However, because I was in the B division I didn't get a bye for winning and so went into round three. Round three was like round two with four-player groups, except only three games were played and, crucially, only the winner progressed. The other tree dropped out at that point. It would be tough to win, but somehow I managed to scrape through and made it into round four where I joined the winners from the A division's round two and those who also survived the 'round of death' - round three. That made fourteen players in all who were paired up for seven best-of-three matches. 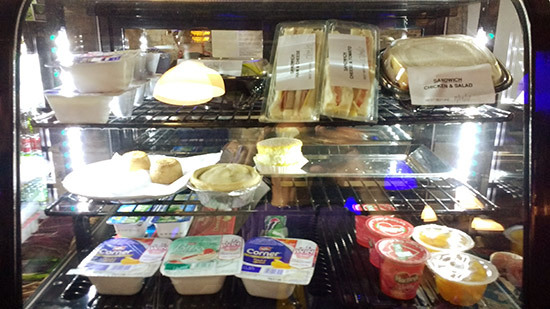 The seven winners progressed along with the 'best performing' loser. 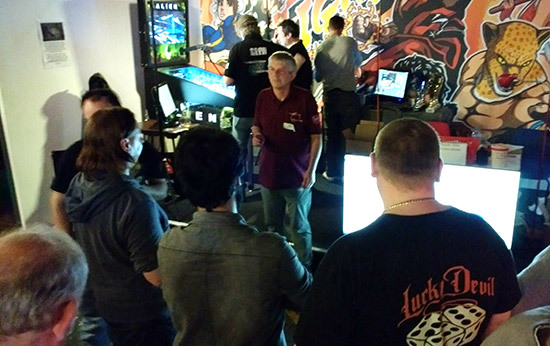 All scores were recorded and the losing player with the best percentage of their scores compared to their opponent went through too. Contrary to expectations, things seemed to be getting a bit easier for me and I won the first two games, meaning the third only counted towards calculating whether my opponent also progressed. With eight players remaining, tournament organiser David Dutton called everyone together to explain how the semi-final and final would work. 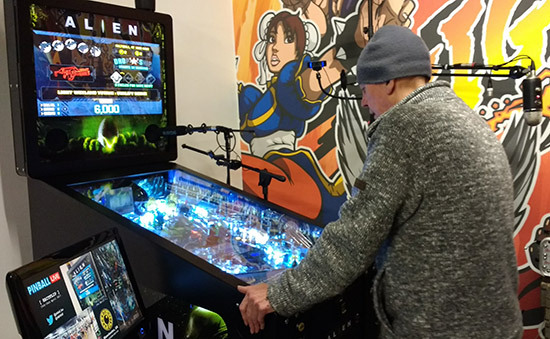 Round five was much the same as the previous round - three game head-to-head matches with the winner progressing and the loser dropping out. This time there was no 'best loser' so only the four winners would go through to the final. I had a couple of reasonable games and so won the round 2-0 to make it to the final. We needed to play the third to decide seeding in the final, and I was able to win that game too. The four finalists were Matt Vince, me, Craig Pullen and Aid Cooper. Matt and I won 3-0 in the fifth round, but he had a better percentage win in round four so took the top seed position. Craig and Aid won 2-1 in the semi-final and were seeded third and fourth for the final. In the final, each player could choose a machine to play, starting with Aid and followed by Craig, me and Matt. 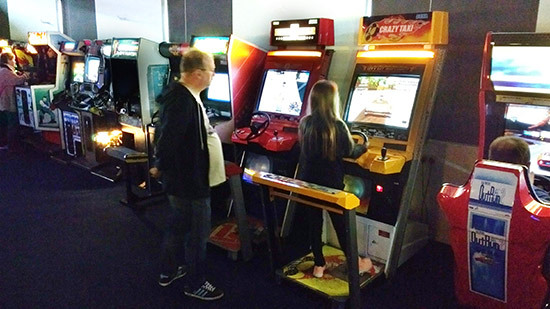 That was also the play order for the first game which then rotated one place each time, meaning the player choosing the machine always played first. The familiar 9/5/2/0 points system was employed to score each game. Aid's choice was Breakshot by Capcom, a game on which he had set the grand champion score earlier in the day and so felt pretty confident picking. 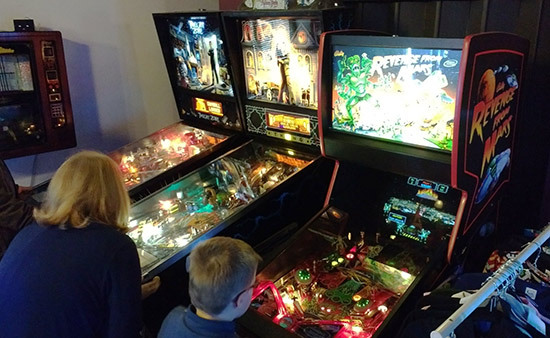 However, as often seems to be the case, after a great game the following one just doesn't compare, and that was the case here as Aid ended up last on his own choice of machine. Craig and Matt seemed to know what they were doing, but Breakshot isn't a game with which I'm overly familiar so I just followed what seemed to be working for them. And it worked for me too. After ball two I had a reasonable lead with 30M racked up, while the third ball consolidated that to end up just shy of 60M, setting the new grand champion score in the process. Not a bad start for me. Craig was second, Matt close behind in third and Aid fourth. Then we moved on to Craig's choice of Bride of Pinbot 2.0. The curse of playing the machine you picked continued as his first two balls drained quickly. I put up a reasonable score as did Matt with Aid not having much luck again. After Craig's third ball only performed a little better, it was between Matt and I to take the top two positions. Matt ended up winning, with me second, Aid third and Craig fourth. Then it was my choice of machine, and I decided to mix things up a bit and play a title I didn't think anyone would know well. So, I picked Premier's Excalibur. Well, no, it didn't. 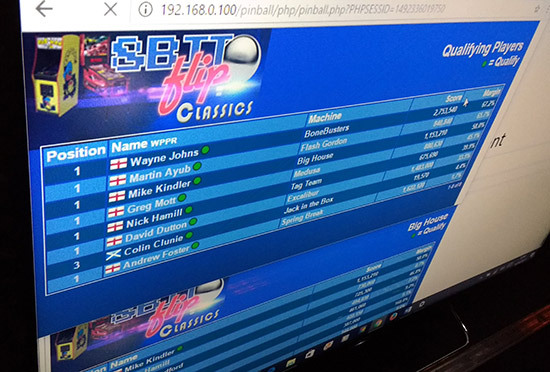 I put up a decent 1.8M total score which looked to be in danger from Craig during our third and last balls, but it held on to give me a second win. Craig was second, Matt third and Aid fourth. I managed to get a ball stuck on the ramp during my game, so I amused the crowd by getting my phone out and taking a 'selfie'. By this stage, with two wins and a second place for a total of 23 points I had already won, so I took the opportunity to buy everyone a drink before we played the fourth and last game of the final. This was to be Matt's choice of Bram Stoker's Dracula, and like my choice it worked well for the player picking it. Craig had already put up a great score on his second ball, so it was up to Matt to beat it for the win. He got close, but in the end Craig won, Matt was second, I was third and Aid was fourth. 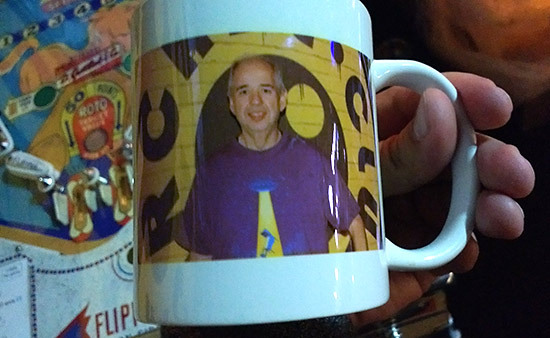 A new feature which was utilised this year was the ability to print images on mugs, so prior to the final I took pictures of all four finalists and e-mailed them to Mark Robinson who printed the mugs overnight ready for the trophy presentation the next day. 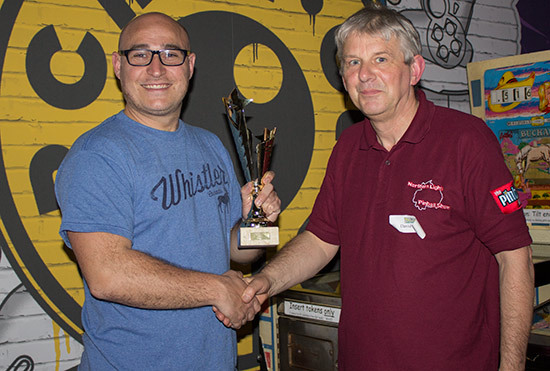 The trophy presentation was held back until after Sunday's tournaments had finished, but here are the pictures anyway, with presentations made by tournament director David Dutton. 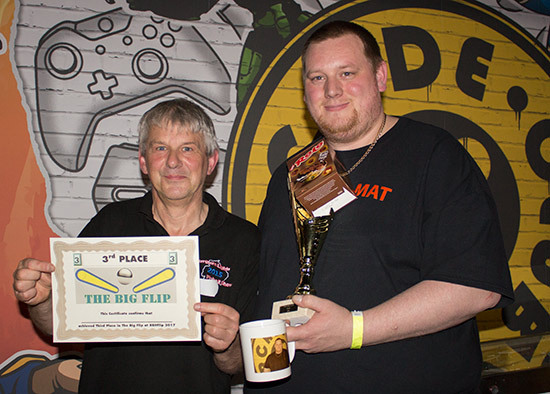 The final of The Big Flip brought Saturday's activities to a close. 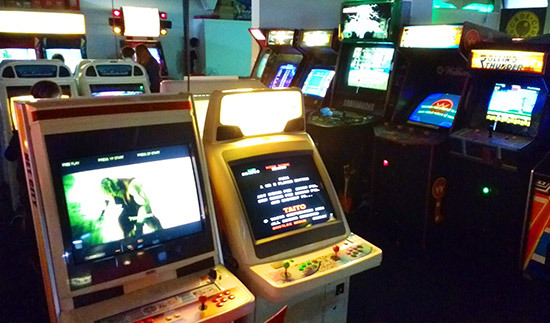 Arcade Club would re-open on Sunday morning at 11am for day two of 8BitFlip. 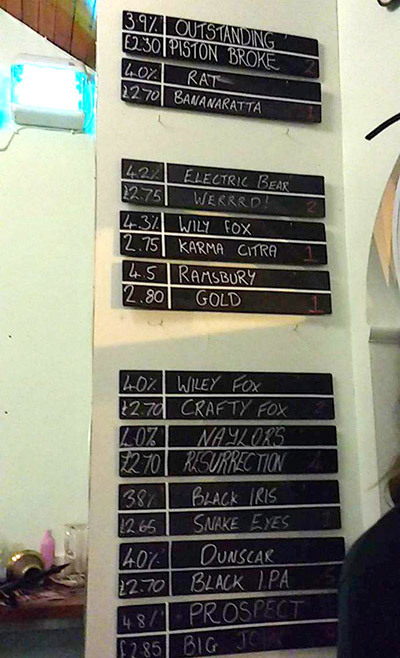 Meanwhile, we enjoyed a few more drinks at the bar before heading off for a Chinese meal and more beers at a nice craft beer bar called The Trackside, which is a repurposed railway station which serves a nice selection of craft beers at very sensible prices of around £2.80 ($3.60/€3.35) for a proper 20oz pint. 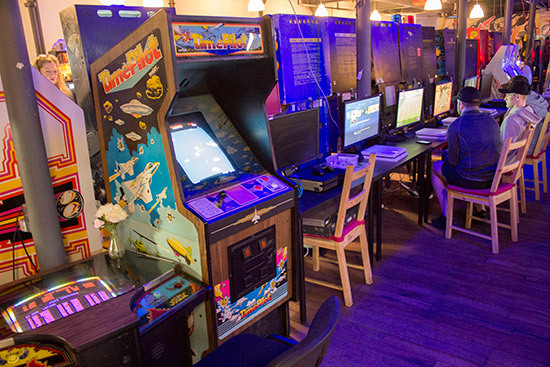 With no trace of a hangover whatsoever, Sunday at 8BitFlip began at 11am with the qualifying round of The Old Flip, 8BitFlip's classic tournament. This tournament had a slightly unusual format. 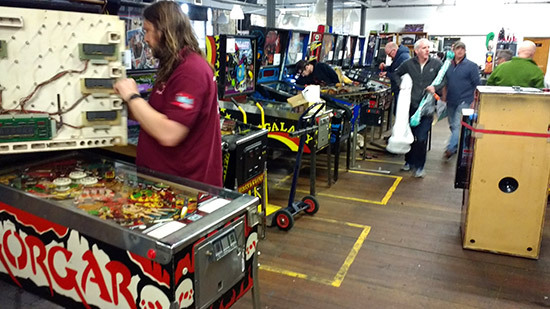 Eight older machines were set up and entrants could choose to play any four of them in an attempt to get the highest score of the day on any one of them. If desired they could then replay any one of them using their 'soft' joker, where a better score replaced an earlier attempt, but a worse score was discarded. 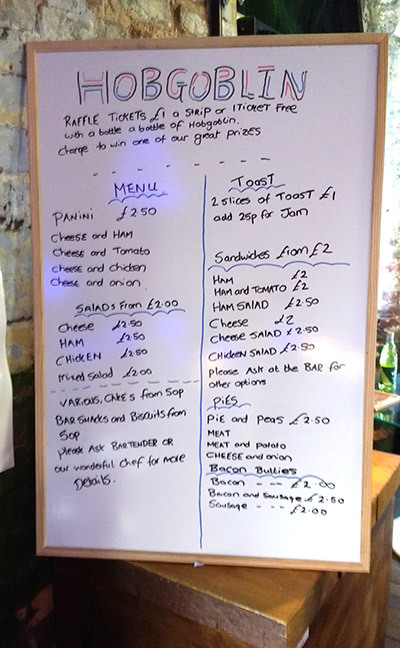 An entry cost £5, but If one entry was not enough, a second entry could also be purchased for another $5. 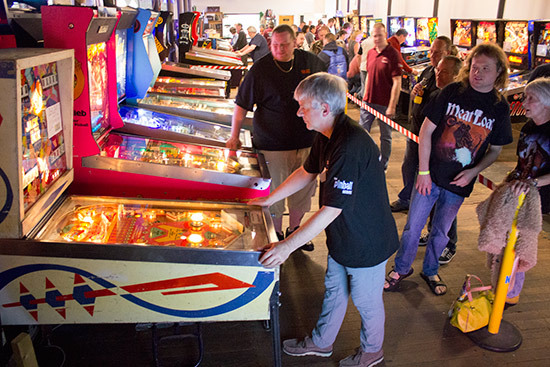 Only the top scorer on each machine moved on to the semi-finals, athough if someone had the top score on more than one machine, the machine on which they had the greatest margin of victory would be the one which counted and the second-placed player on the other machine would progress instead. I started off well, getting the top scores on both Flash Gordon and Jack in the Box. However, I misunderstood the qualifying format and thought all the game scores would be ranked (and with four good scores I thought I would be in a strong position). 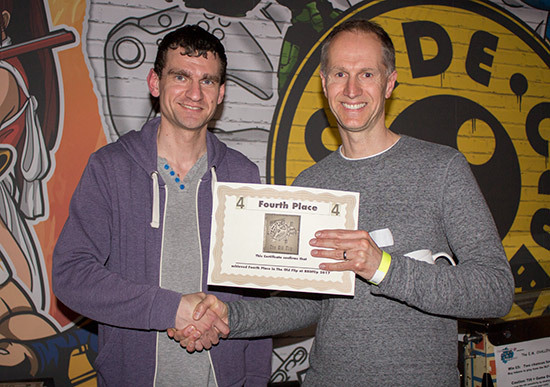 However, as the qualifying period progressed my score on Flash Gordon was narrowly beaten, and then right at the end my Jack in the Box score was beaten too, putting me in second place on both games but without a top score qualifying position. 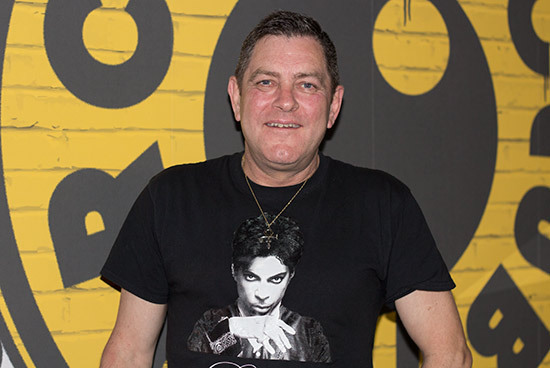 The eight who did make it through were Wayne Johns, Greg Mott, Matt Vince, David Dutton, Andrew Foster, Paul Garner, Dan Lewell and Tom Fletcher. They played a pair of three-game matches with four players per group. 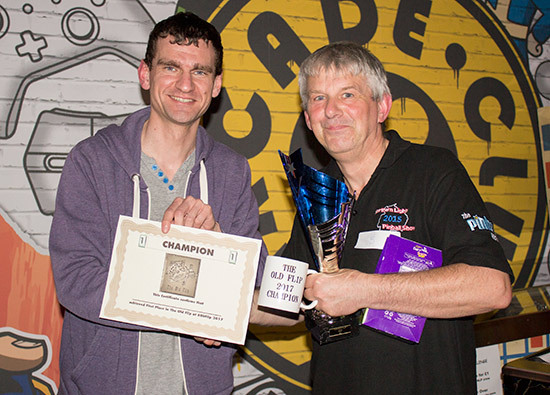 Scores were 7-5-2-1 on each game, and the two players with the most points progressed to the final. They were Matt Vince, Greg Mott, Andrew Foster and David Dutton. The chosen games for the final were picked by the top three qualifiers and were Bonebusters, Medusa and Excalibur. Bonebuster was chosen by David and it worked well for him, giving him the win and the full seven points. Andrew Foster was second, Greg Mott third and Matt Vince fourth. Play then moved on to Greg's choice of Medusa. 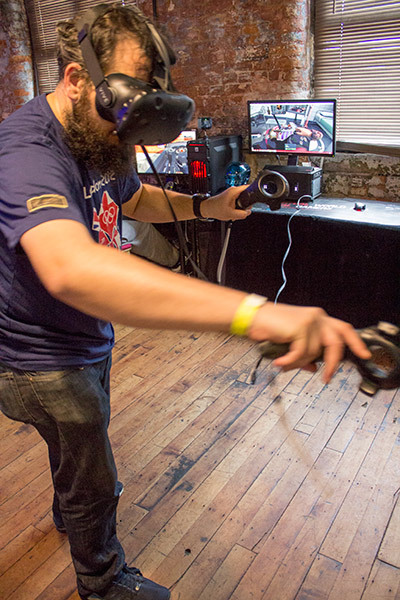 Despite putting up the top score in qualifying, Greg didn't do so well on the same game in the final, only managing third place. Matt won the game, with David second and Andrew fourth. David led with 12 points going into the third and final game, but Matt was close behind on 8 points. 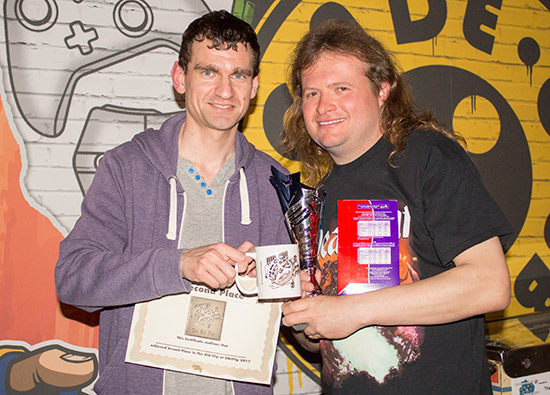 Andrew had 6 points and so was unlikely to win while Greg's 4 points put him out of contention for the win but able to take second or lower if the result of the final game went his way. 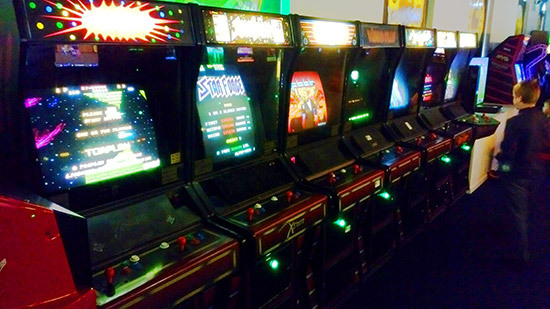 That final game was on Excalibur and the outcome produced an interesting three-way tie. Andrew won, Matt was second, Greg third and David fourth. That meant David, Andrew and Matt all had 13 points and so had to play a deciding game on Jack in the Box. David had a great last ball to take the win. Andrew looked like he was all set to win but had ot settle for second, while Matt ended in third. 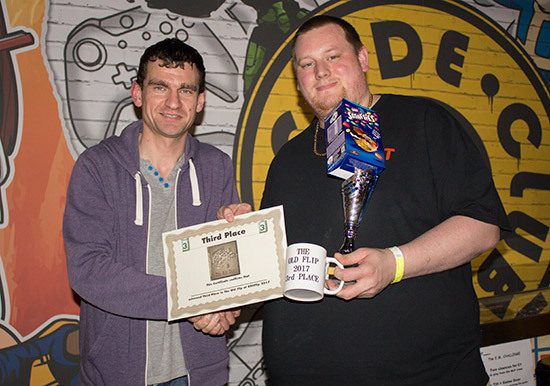 The prizes were presented by tournament director Carl. 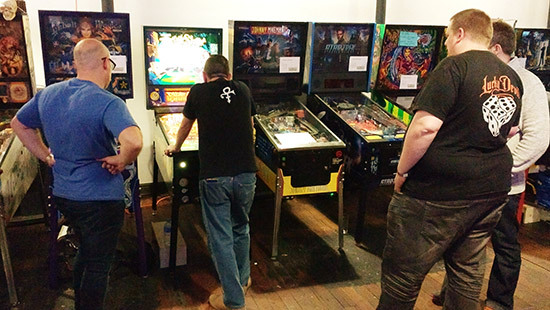 With the tournament over, machines began to be broken down and visitors drifted away as another 8BitFlip event came to a close. 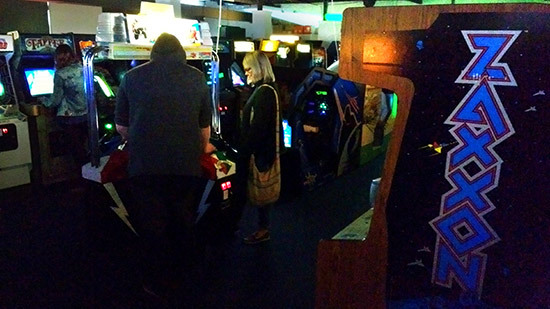 The venue of Arcade Club was much improved since last year's inaugural 8BitFlip at the Bury location. 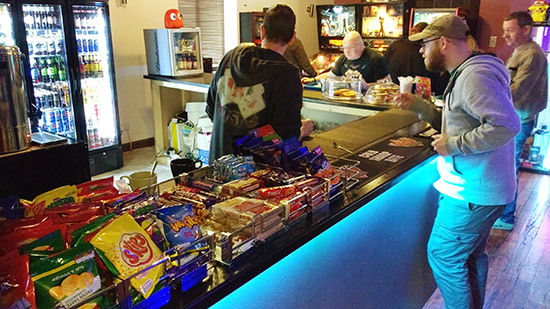 The renovations made the second floor of Ela Mill a much more inviting location with better facilities and a wider range of games to play. This, combined with the two tournaments made it a very worthwhile (if lengthy) trip for me. 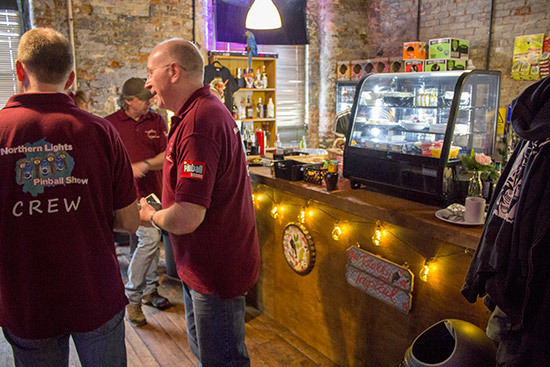 The social aspect of any event outweighs the games to play and we certainly had a couple of enjoyable evenings out on the town, catching up with old friends, enjoying the food, drinks and sights, and talking a lot of rubbish. 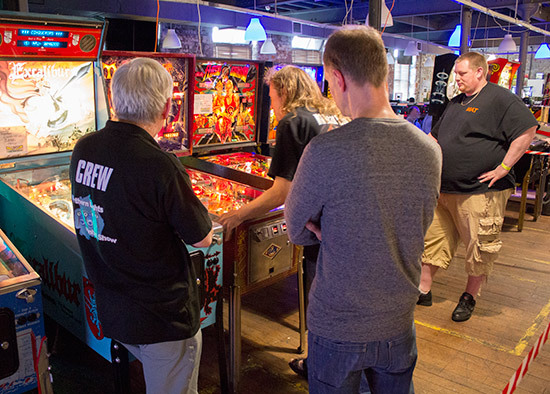 So, it was another thoroughly enjoyable pinball weekend thanks to the Northern Lights Pinball team and Arcade Club. I'll certainly hope to be back next year for more of the same.